Would you like to make a dream come true this year? One moment changes everything when you make a gift to The Lutheran Scholarship Granting Organization of Indiana (Lutheran SGO) for the benefit of students that dream to attend a Lutheran grade school and Lutheran High School. This school year Lutheran High School has $290,000 in unfunded student financial assistance. We all know, without meaningful financial help, the unfunded situation cannot continue indefinitely. While not as large, our Lutheran grade schools are also facing similar situations. How does the Lutheran SGO work? 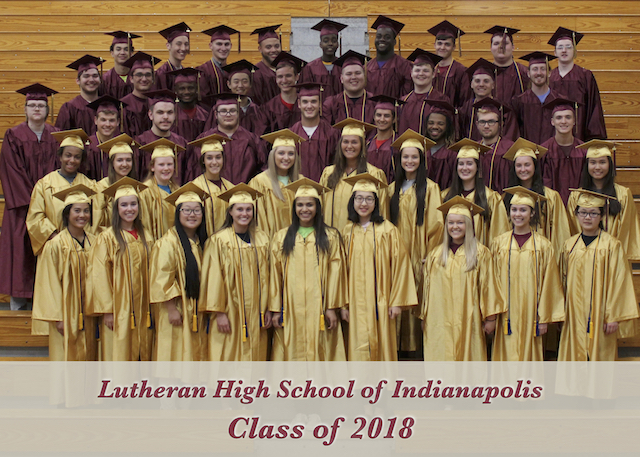 The Lutheran Scholarship Granting Organization of Indiana is a 501(c)(3) non-profit approved by the Internal Revenue Service to receive tax-advantaged contributions and is recognized by the State of Indiana for school scholarship programs. This Indiana organization is authorized to make application on behalf of Indiana taxpayers – individuals or businesses – for a 50% Indiana tax credit for contributions. Direct gifts to "The Indiana Scholarship Granting Organization of Indiana," not to the Lutheran school. (Gifts may be donated by using a check (download form here), online donation (here) credit/debit card, securities, IRA Charitable Rollover for those 70 1/2 years old and older, or even gifts of grain and real estate. Designate this gift to Lutheran High School of Indianapolis, or, better yet, consider dividing your meaningful gift between Lutheran High School of Indianapolis and the Lutheran grade school supported by your Lutheran congregation. Every dollar given by you really matters. The Lutheran SGO can accept employer and association matching gifts. IMPORTANT! To be eligible to receive your Indiana State Tax Credit, for the tax year 2018, your gift must be made to the Lutheran SGO by December 31; after December 31, your gift would be eligible for the tax credit in the following tax year. There is a $14 million per-fiscal-year cap on available state tax credit for up to $28 million in donations available for fiscal year July 1, 2018 to June 30, 2019. Please visit LutheranSGO.org or contact the Lutheran SGO at 260-203-4509 or info@LutheranSGO.org for more information and consult your own tax advisers for your unique situation. We cannot provide tax or financial advice. What is the amount of Indiana State Tax Credits awarded to date? Of the $14,000,000 in credits to be awarded July 1, 2018 – June 30, 2019, as of December 5, 2018 $6,891,498 have been currently awarded, leaving only $7,108,502 in Indiana State Tax Credits to be awarded. Our goal for fiscal year July 1, 2018 – June 30, 2019 is $195,000. 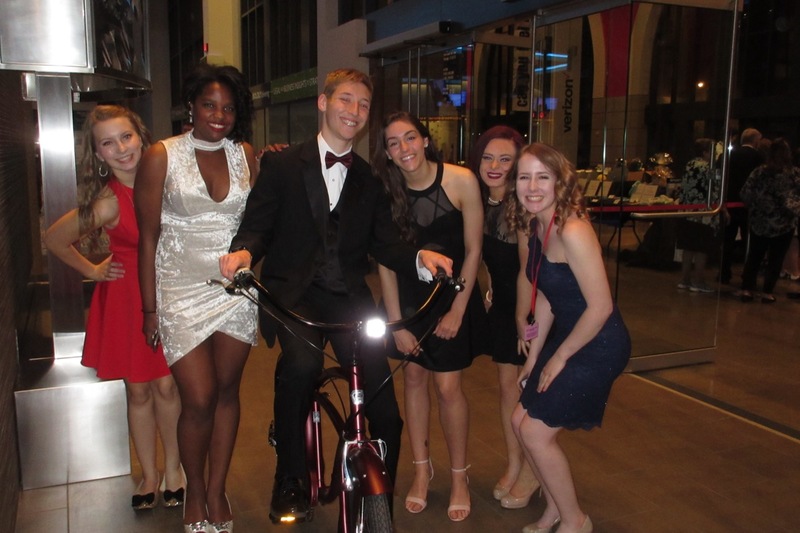 We have raised $39,139 as of December 5, 2018 and we really need your help to do something that really matters to raise the balance for our students. Educating for now and eternity takes place every school day at Lutheran High School. Students learn at a school with Christ as its foundation and hear the message of God's saving grace through Jesus, which preparing for success in an uncertain world. Your Lutheran High School nurtures Christian servant leaders while educating minds for an ever changing and increasingly competitive world. The Lutheran schools in Indiana have worked for 175 years to make a quality, Christ-centered education affordable and available. The help from the Lutheran Scholarship Granting Organization of Indiana is providing another tool for students that dream to attend a Lutheran grade school and Lutheran High School a reality. Through your love, caring, and commitment, you can make a difference for now and eternity by helping to prepare our stdents as children of God academically, physically, socially, emotionally, and spiritually to be servant leaders in the world today and tomorrow. Will you do something that really matters and make a contribution to the Lutheran SGO of Indiana? You will help make a dream come true – and be eligible to receive a special 50% Indiana tax credit. May God continue to bless and cherish you! 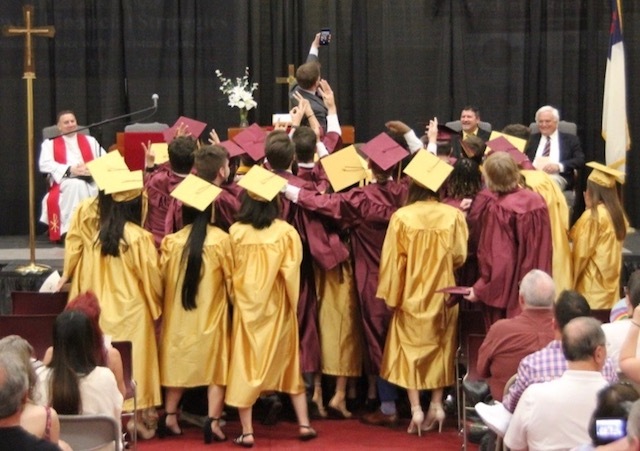 The fortieth Baccalaureate and Commencement of Lutheran High School of Indianapolis was held on Sunday, May 20, 2018. The 46 members of the Class of 2018 were awarded their diplomas during the service. Mr. Matthew T. Frick, LHS teacher and Theatre director, addressed the graduates, faculty, families, and friends, speaking about steadfastness. The class had chosen James 1:12 as their class verse: Blessed is the man who remains steadfast under trial, for when he has stood the test he will receive the crown of life, which God has promised to those who love Him. He also took a selfie with the entire class! 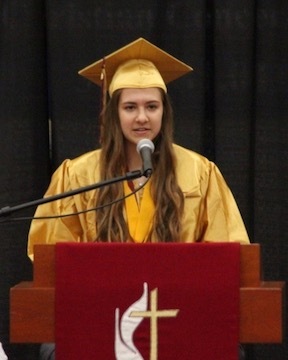 Mr. Ted Deitz presented the salutatory address and Miss Janessa gave the valedictory address. Special presentations were made to several individuals. The Evelyn Benning Service Award was presented to Jim and Beth (Pride, LHS 1994) Knight (read more). 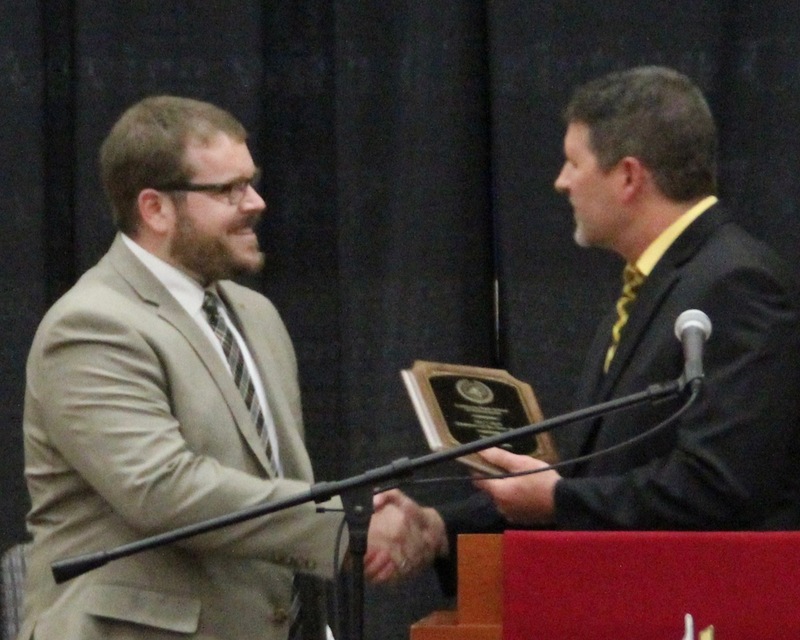 Matt Riley (LHS 2004) was named Alumnus of the Year for 2017-2018 (more here). 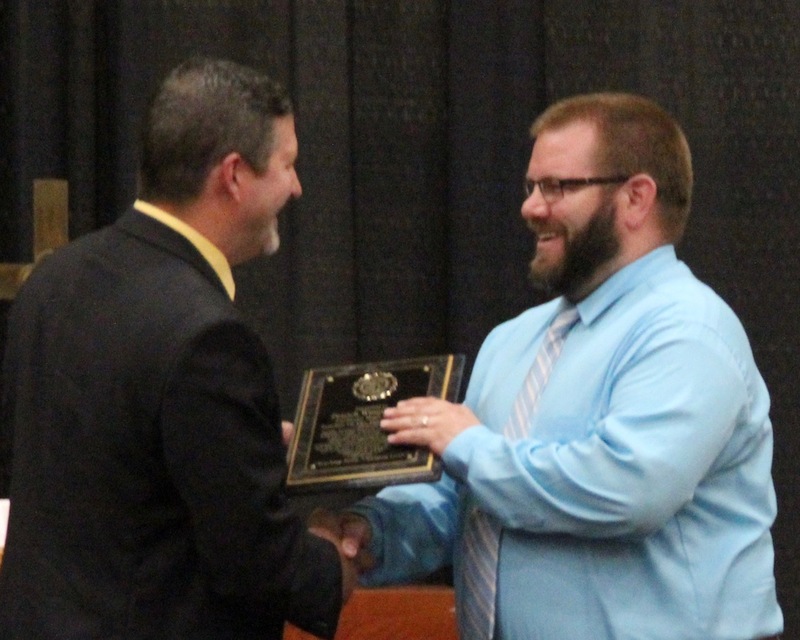 Mr. Patrick Winningham was awarded Teacher of the Year (read about it). 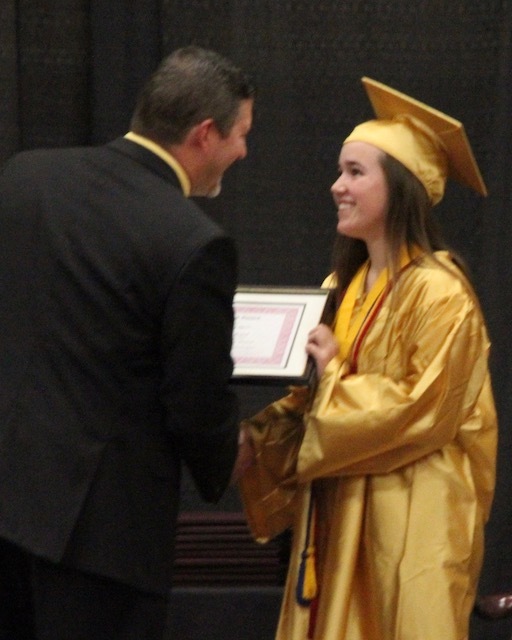 The Outstanding Senior Award was presented to Miss Shelby Hedges. See more pictures from before, during, and after the graduation ceremony here. Patrick Winningham has been named the 2017-2018 Teacher of the Year. 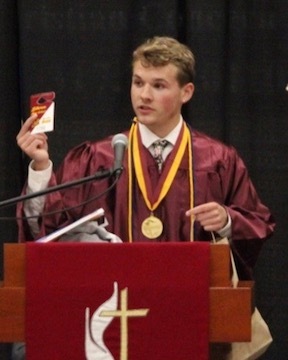 He was presented a plaque by Head of School, Michael Brandt, during Graduation on May 20, 2018. The LHS Teacher of the Year Award recognizes and honors the contributions that all teachers give each year to the school's student body and its community of families. The hours and dedication of service shared by all these great teachers come from lives dedicated in supporting students and making a positive difference with them. This award celebrated one who exemplifies excellence, inspires othes to similar heights, and reinforces the ideals LHS seeks to follow. "Patrick Winningham accepted a call to teach at Lutheran High School in 2007. "As a choir and band director, Mr. Winningham prepared students to give top performances at concerts both at home and across the country. Mr. Winningham also encouraged musical students in theatre, piano, and music theory. "While not in the music room, Mr. Winningham could be found teaching U.S. History with high student achievement records in advanced placement college testing. "Mr. Winningham has accepted a call to serve as a teacher at Valley Lutheran High School in Saginaw, MI. We will miss this high energy, compassionate, and organized teacher. We will miss hearing about his latest discoveries through the various travels that only he could fabricate. "Most of all, we will miss the genuine Christian mentor, teacher, colleague, and friend we have had in Mr. Winningham." Jim and Beth Knight received the 2017-2018 Evelyn Benning Service Award during the 40th Baccalaureate and Commencement on May 20, 2018. "We are all very thankful and know that the Lord has blessed Lutheran High School through the servanthood of Jim and Beth Knight. They exemplify the love of Jesus Christ as they give of their time, talent, and commitment to the projects of Lutheran High School. "Jim can be found volunteering as a Saints coach, organizing junior athletic events, and working along side his wife for a Saints event. "Beth gives of her time an talent as our LuFest chair, lunchtime volunteer, and very active athletic booster club member. "Those who have been blessed to work with either of these two will attest to their desire for LHS to be excellent in all ways. We praise the Lord that both Jim and Beth can openly serve and make themselves available to the efforts of Lutheran High School." 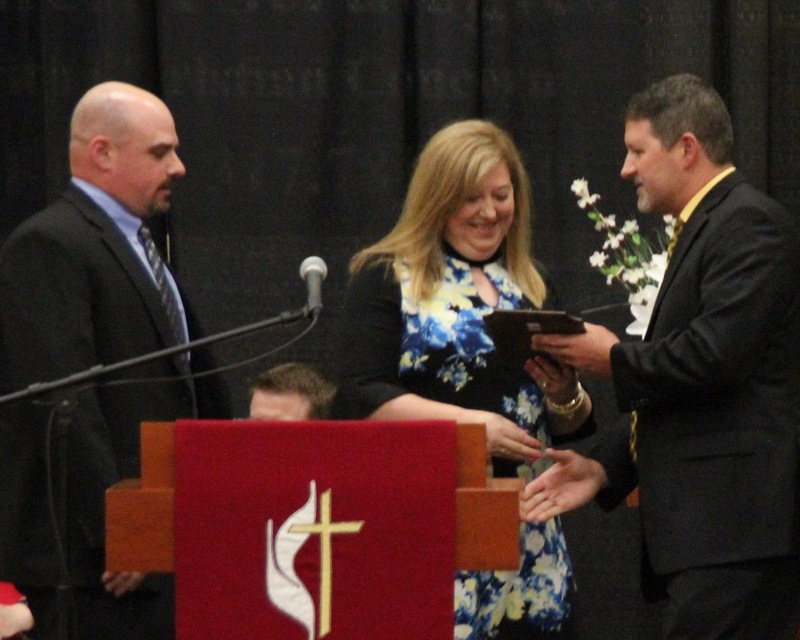 The Evelyn Benning Service Award was establised by the LHS Board of Directors to bring honor and celebration to our Heavenly Father and His desire for us to be servant leaders. Evelyn Benning exemmplified this foundation of servant leadership to LHS and therefore was recognized as the first recipient and namesake in 1991. Since that time individuals receiving this award have demonstrated the servanthood of time and talent that is directly related to the success of our LHS programs. Previous recipients of this award may be seen here. Thank you for supporting and/or attending LuFest 2018. I hope that you enjoyed your evening. On behalf of the LuFest committee, I want to thank you for helping to make LuFest 2018 a huge success! I am excited to share with you just how successful our event was. Because of you, we exceeded our goal for our Special Appeal. Together, you donated $52,835 for “Operation Dry Tile.” This is a roof repair project that is long overdue and greatly needed. Lutheran High School will be able to replace a trouble-section of our roof. This means no more rain water entering the building and a safer environment for our students for years to come. Because of you, the proceeds from the silent auction were $23,187 and our live auction proceeds were $17,000. You also donated to the general LuFest budget, contributed funds that provided tickets for faculty and staff to attend the event, played heads or tails with us, and purchased wine or bourbon.Because of you, our net profit for Lufest 2018 is over $101,000 to help support the mission and ministry of Lutheran High School. That is record breaking! God is good! We praise Him for his bountiful blessings. Because of you, Lutheran High School will continue to be an excellent place for students to advance their minds and grow in their relationship with God. I cannot thank you enough for you your prayers, time, donations, and financial support. Lutheran High School is blessed by your generosity. We have already begun planning next year’s LuFest and invite you to join us. We are looking forward to spending another evening with our Saints family. Click on the picture or here to see more photos from LuFest 2018. Congrats to all! What a wonderful evening... and we thank all the faculty, staff, students, and LuFest team who welcomed us and made it a great celebration. God bless you all! J. Douglas Boles, President of the Indianapolis Motor Speedway Corporation, was the inaugural speaker of the newly-launched Ruth Lilly Distinguished Speaker Series at Lutheran High School of Indianapolis on February 9, 2018. Chip Ganassi Racing provided a race car on stage as a backdrop for his talk, which served to create a vivid image for students and guests. Mr. Boles spoke on servant leadership and the importance of one’s faith in the racing and business world. According to Mr. Boles, your ideas, values, and faith will impact you and your life, whatever your focus or career. He challenged students, “Have faith that God has a plan for you.” Mr. Boles combined his talk with a time for questions and answers. Before his talk, Mr. Boles signed several pieces of IMS memorabilia to be auctioned off at this year's LuFest. 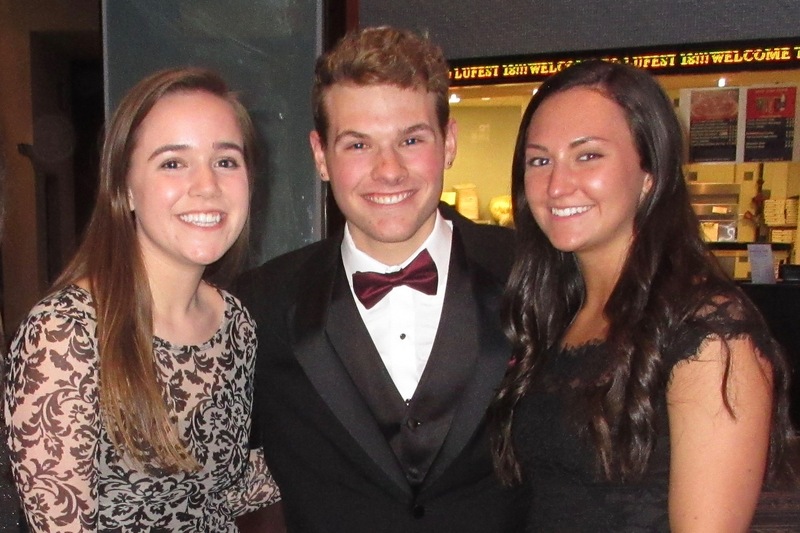 You may view other photos from Mr. Boles' time at LHS in our Photo Gallery (here). While Mr. Boles is responsible for the daily operations of the Indianapolis Motor Speedway and all four world-class racing events at the facility – the Indianapolis 500, presented by PennGrade Motor Oil, the Indy Car Grand Prix, the Brickyard 400, and the Red Bull Air Race – he practices his faith on a daily basis. As President of the Indianapolis Motor Speedway Corporation, Mr. Boles oversaw the investment of over $100,000,000 in renovations of the 108-year-old venue, the largest sporting venue in the world, and the implementation of the 100th running of the Indianapolis 500. The 2018/2019 Ruth Lilly Distinguished Speaker Series, sponsored by Hanna’s Wrecker, Parts & Recycling, will present its second lecture in the series in the fall.